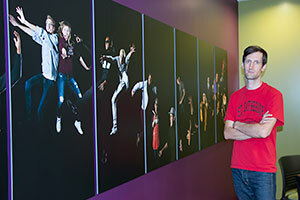 A plain purple wall in McHenry County College’s (MCC) Commons area has been enlivened with a photography mural, titled “Trajectory,” that depicts MCC students in different points of their educational journey at the college. Created by MCC photography instructor Justin Schmitz, the mural is the culmination of six months of photographing and editing during the college’s 50th anniversary in 2017 and was installed earlier this year. Schmitz took 1,000 photos of students in a variety of activities from multiple disciplines and chose 23 students to highlight in the mural, including traditional age students, college athletes, graduates and retirees who enroll in college for self-enrichment. Some of the subjects overlap onto adjacent panels, creating a look of continuous motion throughout a total of nine unframed panels. The mural measures 42 inches by 210 inches and the archival ink jet print is mounted on sintra. Schmitz earned his Bachelor of Fine Arts from Columbia College in Chicago and his Masters in Fine Arts from Yale University. He has exhibited his work in the U.S. and in Europe. Schmitz said he specializes in capturing the awkwardness of growing up and uncertainty found in moments of transition. Schmitz said he felt a connection with the students he photographed—especially the athletes and his own graduating students. MCC’s art gallery curator Sandra Lang invited Schmitz to create the mural after she saw his work at the college’s annual solo faculty exhibition in 2016, the first year he started teaching at MCC. Lang said that Schmitz’ mural is one of 700 pieces of art in the college’s permanent collection, not including the Portrait in Print Collection in the library, that includes a diverse selection of pieces by students, faculty, local, regional and national artists. “It’s exciting to be able to fill this space in a provocative, eye-catching way and still is grounded in my intention as an artist,” Schmitz said. "I wanted to find students who represent the spirit of the college. The photo is broken up into panels to break up the pace and create a more dynamic and interesting mural."